When is Denise's Birthday? Ridde with answer. Albert, Bernard and Cheryl became friends with Denise, and they wanted to know when her birthday is. 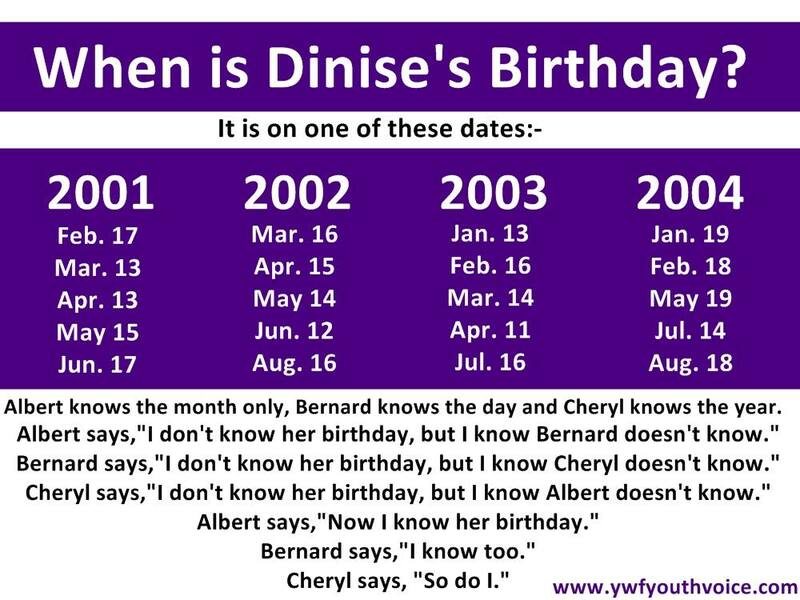 Denise gave them a list of 20 possible dates and then told Albert, Bernard and Cheryl separately the month, the day and the year of her birthday respectively. Now they know the answer i.e exact birthday date of Denise without sharing any information with each other. Albert, Bernard and Cheryl became friends with Denise, and they wanted to know when her birthday is. Denise gave them a list of 20 possible dates. Denise then told Albert, Bernard and Cheryl separately the month, the day and the year of her birthday respectively. Albert: I don’t know when Denise’s birthday is, but I know that Bernard does not know. Bernard: I still don’t know when Denise’s birthday is, but I know that Cheryl still does not know. Cheryl: I still don’t know when Denise’s birthday is, but I know that Albert still does not know. Albert: Now I know when Denise’s birthday is. Bernard: Now I know too. So, when is Denise’s birthday? To clarify: neither Albert, Bernard or Cheryl know anything else at the start apart from the fact that Albert has been told the month, Bernard the day (meaning the number of the day), and Cheryl the year. Albert says he doen't know the answer which is obvious as he only knows month and there are atleast two "days" available for a given month. Albert says,"Now I know her birthday" implying that the correct month appears only once in available options i.e May and the exact birthday date is May 14, 2002. Now all of them knows that Denise's birthday without telling each other anything. Cool, right? Let us know in comments if you were able to solve this riddle without seeing the answer. Click here for one more cool riddle like this one. Youth Voice: When is Denise's Birthday? Ridde with answer.